The link above is for the full screen collector's edition. 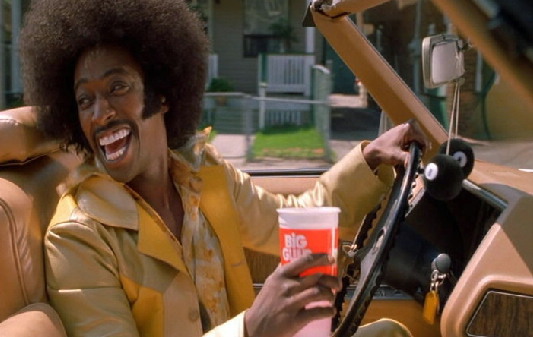 Undercover Brother (2002): This movie seems to be in the same vain as the previous year's "Pootie Tang". Premise: a hip, but goofy black hero fights a white oppressor and is complimented by an exciting cast of characters. I love this movie! Although it has a mostly black cast, I don't know if you could call it a strictly "black" film; white people and other kinds of people can watch it and get just as big a kick out of it as black people...maybe even more so. There is some light anti-white satire in this film, but more of it seems to make fun of black stuff. Nothing at all that's real negative...just funny. Although set in modern-day, we have a very funky 1970s retro theme, especially with the title character but also in the setup of the film. Eddie Griffin is Undercover Brother. That's all he's ever called. He's got a big Afro, even bigger ego, and funky, colorful clothes to match. HE IS FUNNY! He teams up with a secret organization called the B.R.O.T.H.E.R.H.O.O.D. in order to stop a grand conspiracy set by The Man and his top agent Mr. Feather. With UB's superior fighting skills and the B.R.O.T.H.E.R.H.O.O.D. 's advanced crime-fighting gadgetry, he takes on The Man and stops him from brainwashing black people with tainted fried chicken, courtesy of a fast food chain. It all starts when General Warren Boutwell, a powerful figure in Washington, is brainwashed by The Man into, not running for President, but running General's Fried Chicken. Billy Dee Williams, who plays Boutwell, is unexpectedly hilarious as the duped black General, a Colin Powell-styled character. Williams usually does serious dramatic roles, so seeing him do something that's funny is a nice change of pace. Upon investigating the situation, Undercover Brother and his crew learn of the more sinister plot. The Man is credited to laming up black popular culture in the 1980s to today and trying to disturb racial harmony. An obscure figure, most of his handiwork is done through Mr. Feather (Chris Kattan of "Saturday Night Live" fame, a white guy who has an identity crisis and an uncontrollable desire to get ebonic. When Undercover Brother starts to get a little too close to destroying their plans, Mr. Feather calls in his agent, the beautiful White She-Devil, to seduce Undercover Brother and assimilate him into white society. Denise Richards is outstanding as White She-Devil and really shines in this comedy role. I like her in all her movies, but it's unexpected to see her do straight comedy. Mr. Feather's plan almost works, but the B.R.O.T.H.E.R.H.O.O.D. agents step in to save UB so he, in turn, can stop The Man. Sistah Girl is played by Aunjanue Ellis and is Undercover Brother's love interest. She's a straight-arrow, no nonsense agent until after meeting Undercover Brother...then she becomes funky! The Chief is the head of the agency and played by Chi McBride who has been in many great movies, usually playing some sort of authority figure. His first name, by the way, is pronounced "shy". The Chief is always flying off the handle and saying stupid things that the rest of the team catches him on. Definitely disgruntled. Even more disgruntled is Conspiracy Brother, played by the super-popular comedian Dave Chapelle. As his name implies, every single thing is a conspiracy, no matter how far out or nonsensical. He's even too much for people with "black pride" to take. And he definitely has a marijuana problem and strong dislike for whites. Just to be perfectly clear, the B.R.O.T.H.E.R.H.O.O.D. (as well as this movie) is not anti-white, they're just trying to keep The Man from holding black people down. They're about equality, whereas Conspiracy Brother himself is way too extreme, but that's what makes him funny. Last, but not least, is my favorite character from the agency Smart Brother played hilariously by Gary Anthony Williams. He's the "chunky brother in the smock", an inventive genius who designs UB's funky gadgetry. He's the one UB gets along with best. Definitely silly and articulate. I identify best with the smart, goofy types. Big surprise, huh? Also worthy of mention is Neil Patrick Harris (TVs "Doogie Howser, M.D.") as Lance, a lame white boy who works at the B.R.O.T.H.E.R.H.O.O.D. basically as an intern, but eventually becomes an active agent. I'm not a great fan of "Doogie Howser" or some of Harris' other shows, but he surprised me in this appearance. He's actually funny and can do goofy comedy. I like the cast for this movie a lot. The soundtrack is also great, filled with suitably funky 1970s music. The filming itself is quite bright and colorful. Visually, it's interesting to see thanks to all the funky costumes, cars, and action sequences. The overall mood of this movie is feel-good and optimistic, although you might think otherwise if you read the plot off the back of the video box or somewhere else...let my words set you straight. And another plus: it's not over-filled with profanity. Too many "black" movies nowadays are filled with too many swear words that just aren't called for. If there is swearing in this movie, and there isn't a lot by any means, it's meant just as a seasoning. In its place is clever, funny dialogue and innuendo. That's just good writing. "Undercover Brother" is many things. It's a spoof of the 1970s-era blaxploitation films, a comedy, an action film, and yes, even a superhero film. Even pre-teens would enjoy this movie.